As the sun went down after a beautiful autumn day the spotlights around Prague's historic Old Town Square were shining on elite athletes taking part in the men's 10km and women's 5km races. Defending champion from last year, Dickson Marwa, was led off by the Moroccan, Mourad Marofit, followed by the New Zealand twins, Jake and Zane Robertson, who led the charge down the famous Parizska Street and out into the night. Back through the Square at 2km these four were some 15 seconds ahead of the top Czech runner, Jan Kreisinger. Marofit made his break for home in the last kilometre. The adidas Women's Race 5km preceeded the men's race by an hour, and had also featured a group of four runners detatched at 4km, and all in with a chance. Zakia Mrisho kicked clear over the final stretch. Hilda Kibet clocked the fastest 10-mile performance of the year. The men's race was won by 19-year-old Kenyan John Mwangangi, who outsprinted 2009 winner Moses Masai by one second to post the second fastest time of the year. Elite women started 5 minutes 46 seconds before the men to create a confrontation between the sexes in the closing stages. Lornah Kiplaget, an aunt to Hilda Kibet, took the early lead along with Ethiopian Mestewat Tufa. The three went out fast with the experienced Kiplagat, who last Sunday took the Dutch 10K title in Tilburg, forcing the pace. By 10km, reached in 31:35, Tufa was running behind the leaders and losing contact. Kibet was now pressing and Kiplagat eventually lost contact as well due to pain in her lower leg, although she did manage to finish. 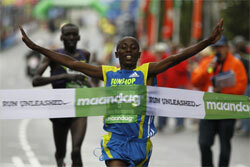 Running in light rain and 17°C temperatures, Kibet forged on but was not able to fight off the chasing men. With thousands of spectators lining the streets in Zaandam, Kibet lost her shot at the 5000 EUR bonus for being first over the line. In the men's race, eight African runners were led by Kenyan Jonathan Maiyo who brought them through 5km in 14:12. As the pace remained swift, the leading group broke up, and Maiyo had only, Masai, Ayele Abshiro and Mwangangi with him at 10km (28:16). The four stayed together until they reached the streets of Zaandam, where Masai and Mwangangi went a few seconds ahead before the young Mwangangi outsprinted the defending champion to take the victory. Patrick Makau won a rainswept 37th edition just two seconds ahead of Geoffrey Mutai, writes Pat Butcher. The two Kenyans are also the world's fastest marathoners this year, having finished in the same order at Rotterdam in April, in 2.04.48 and 2.04.55 respectively. Third-placed Worku, is just ten days past his 20th birthday. Despite the conditions, these three ran the fifth, sixth and seventh fastest times ever. Rain felling steadily throughout race, as it had for the previous 12 hours, but with a temperature of 11°C, no wind and a brisk early pace,there were still hopes of a record. After 15km the pace dropped, with the leaders passing halfway in 1:02:37. At 30km Worku and Mutai eased away from the pack and pacers, with Makau in close attendance. It remained like that for 8km but at 39km Makau first let Worku take the leade before steaming past him just before 40km. 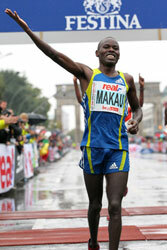 Mutai kept up as they ran abreast through the Brandenburg Gate, with 350m to go, but Makau eased away comfortably in the final 200m. Waiting to greet the top two was Kenyan Prime Minster, Raila Odinga. The Ethiopian pair of Aberu Kebede and Bezunesh Bekele dominated their opposition in the women's race along with Genet Getanah who dropped out at 35km. They led from the start and held a minute advantage at halfway. 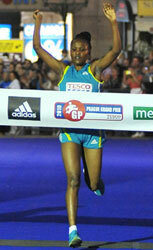 Kebede eased away after 25km, building up a 30 second lead in the next 5km which she had doubled by the finish line. Kebede ran her second half a minute faster than the first. 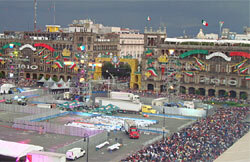 There were an estimated 40,000 starters. 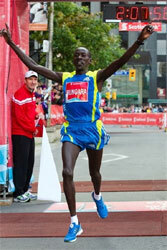 Leonard Komen set a new world record for 10km on the road (subject to ratification), 17 seconds faster than the previously existing mark. 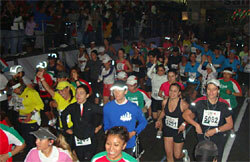 There were 3150 runners in the 25th Anniversary race - despite the rain. The Hungarian President, Pal Schmitt fired the start gun as drummers, the speaker and the cheering crowd enlivened the atmosphere. 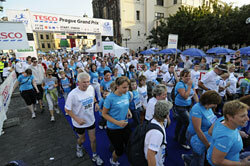 Over all the distances (marathon, 30km, relay for 3 and 5, minimarathon, fun run) there were 13800 runners filling the streets of Budapest. 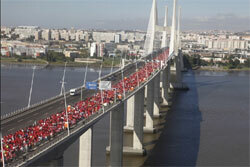 Despite the weather it was a real running festival. 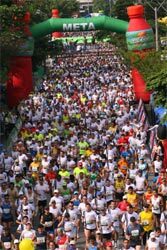 The 1300 foreign runners came from 50 countries from all over the world, the largest groups from France, Italy, Great Britain, Finland and Germany. 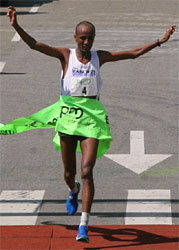 The men's winner was Erkolo Ashenafi, an Ethiopian runner living in Hungary. In the women's race Simona Staicu set a new course record. 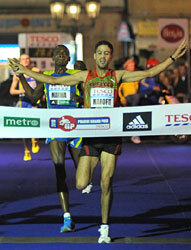 Kenneth Mungara ran away from a world class in the final 5km to win his third consecutive title writes Paul Gaines. He lowered his Canadian all-comers record to 2:07:57. 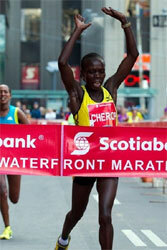 In the women's race Sharon Cherop romped home with the fifth fastest run of the year and also a Canadian All-Comers record. Conditions were perfect (11°C) and the pacemakers towed a dozen contenders through half way in 63:42. Several times Mungara looked over his shoulder but the outcome was never in doubt, although his compatriot Jafred Chirchir ran a personal best in pursuit. At the post event press conference Mungara was asked if he will now go to a 'bigger event like Boston or New York'. The affable Kenyan smiled and admitted he has already promised race director Alan Brookes he will return next year, because Toronto is a world class event. Canadians Reid Coolsaet and Eric Gillis, who train together, also took advantage of the conditions to record personal bests. Coolsaet achieved Athletics Canada's Olympic qualifying standard with a huge personal best time of 2:11:22, good enough for 10th place. "The weather was perfect today. I knew I had to take advantage of it so I went out with 65 minutes. I faded a bit but I rallied to get the Canadian Olympic standard." The women's race was a brilliant competition with four athletes beating the Canadian All Comer's record, held by Lydia Simon of Romania since the 2001 IAAF World Championships in Edmonton. Despite falling on the road at 30km Sharon Cherop recovered and just held off Ethiopia's Tirfi Tsegaye with a huge personal best performance. 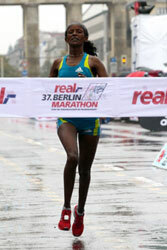 She has run six marathons in the past and had won the 2010 Hamburg marathon in a then personal best of 2:28:38. "This was my first time in Canada and I want to come here next year," she declared. "In Hamburg there was no one to push me. Today it was good."